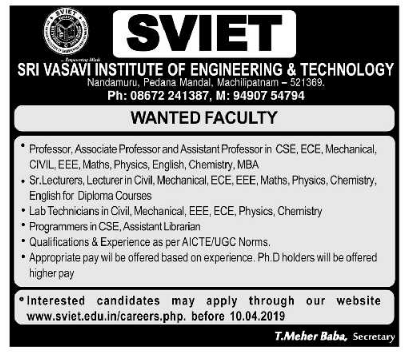 Sri Vasavi Institute of Engineering and Technology, Krishna has advertised in the EENADU newspaper for recruitment of Professor / Associate Professor / Assistant Professor / Senior Lecturers / Lecturers Plus Non-Faculty jobs vacancies. Interested and eligible job aspirants are requested to apply on or before 10th April 2019. Check out further more details below. About College: SVIET is approved by AICTE, New Delhi and affiliated to JNTU, Kakinada. The greenish landscape of the college and the surrounding fields fosters the spirit of creativity, innovation and experimentation in the blooming minds. How to Apply: Interested candidates are requested to send CV along with all copies of certificates and recent passport size photos to the email address or postal address provided below.